Orange is the September Rainbow Scrap Challenge colour for the month. I had sometime today to sew and watch TV. I watched Spruce Meadows Show Jumping, wishing I was there. 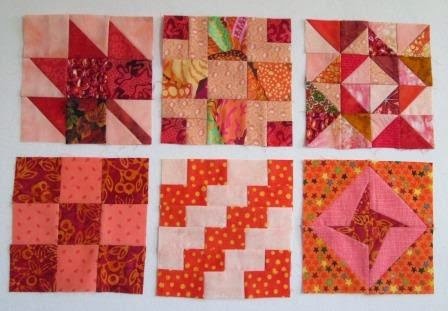 I got 6 sampler blocks done. They measure 6 1/2". As we had snow earlier this week it is feeling like fall, so I had to make a leaf block. I happen to quickly find a pattern to follow in my Farmer's Wife Book. So the next 2 and the center bottom one was also from the book. I did a simple 9 patch and the the star made with the triangles on the outside. Wow sounds nice and quick but, it always takes more time with the scraps. Here is the box of scraps I was working with today. Kind of sorted. 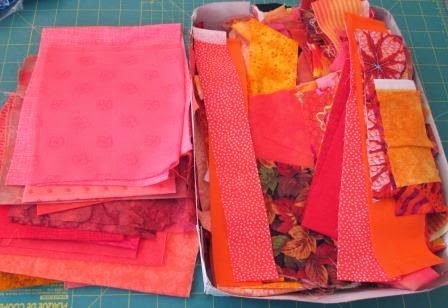 I have added today's post to Soscrappy for more Orange ideas go see. Friday and Saturday was the Creative Stitches show in Sherwood Park/ Edmonton. I made it again this year, Friday. I did some packet book damage. I bought a few more Kaffe Fassett fabrics again. I was worried about not have enough different colours for my Dear Jane. I was pleased to find 4 very good Oranges and some more Blues, that I did not have before. Some are Fat quarters and some are half meters. I also got 2 books and a few jewelry findings. Love the orange sample blocks. 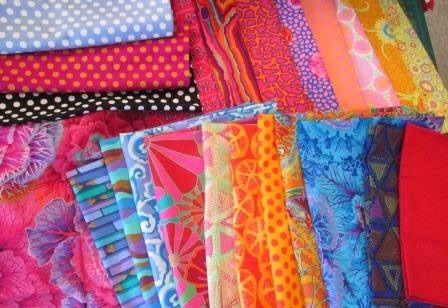 You scored some beautiful fabrics to add to your stash. I just love that orange star block on the bottom row. I was thinking a maple leaf block this month too - think I'll make one tomorrow if I can sneak in a few minutes to sew.